The Medical Faculty Council honored the 2019 Mentor of the Year Award recipients at a workshop on March 13, where the awardees shared strategies and discussed their backgrounds and experiences with mentorship. This year’s recipients were Tamara Isakova, MD, MMSc, associate professor of Medicine in the Division of Nephrology and Hypertension and director of the Center for Translational Metabolism and Health within the Institute for Public Health and Medicine (IPHAM), and John Varga, MD, director of the Northwestern Scleroderma Program and the John and Nancy Hughes Distinguished Professor of Medicine in the Division of Rheumatology. Isakova and Varga will formally receive their awards at the official Mentor of the Year Award ceremony during the 15th Annual Lewis Landsberg Research Day on Thursday, April 4. “No matter what stage of your career you are in, we all need a mentor,” said June McKoy, MD, JD, MBA, ’01 GME, president of the Medical Faculty Council (MFC) and associate professor of Medicine in the Division of General Internal Medicine and Geriatrics. Isakova was nominated by Susan Quaggin, MD, chief of Nephrology and Hypertension in the Department of Medicine, who also introduced Isakova at the workshop. The 2019 Mentor of the Year awardees with their nominators and June McKoy, MD, JD, MBA, ’01 GME, president of the Medical Faculty Council. 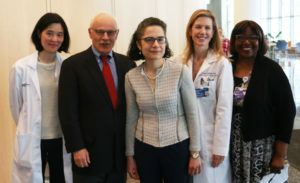 From left to right: Karen Ho, MD; John Varga, MD; Tamara Isakova, MD, MMSc; Susan Quaggin, MD; and McKoy. Isakova joined Northwestern in 2013. She earned her medical degree from SUNY Downstate Medical Center, and completed residency and fellowship training at Massachusetts General Hospital. She also holds a master’s in clinical and physiological investigation from Harvard Medical School. At Northwestern, Isakova is a clinical nephrologist and an active investigator, with close to 40 peer-reviewed publications. She is widely recognized as an expert in disordered mineral metabolism in chronic kidney disease. During her presentation, Isakova discussed the importance of fostering grit through mentorship, as inspired by the book Grit by Angela Duckworth. “It’s not about talent and it’s not about IQ. But it is about a combination of passion and perseverance — and this combination can actually be cultivated, and it’s what helps people succeed,” Isakova said. Although Isakova shared a variety of lessons derived from her experiences as both a mentee and mentor, she concluded that instilling passion is paramount. “The idea that you take pride in your work, and you view your work as your art — I think that’s probably the most meaningful lesson that I learned over the years,” she said. Varga was nominated by Karen Ho, MD, associate professor of Surgery in the Division of Vascular Surgery. Varga earned his medical degree from New York University, followed by residency training at Brown University/Rhode Island Hospital and fellowships at Boston University Medical Center and University of Pennsylvania Health System. 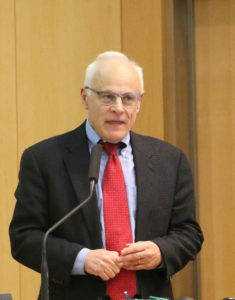 Varga during the 2019 Faculty Mentor of the Year Award Mentoring Workshop. Varga, who joined Northwestern in 2004, founded the Northwestern Scleroderma Program, one of the largest in the country. He is a master of the American College of Rheumatology and in 2017 received the Lifetime Achievement Award from the Scleroderma Foundation. Varga and Ho are also members of the Robert H. Lurie Comprehensive Cancer Center of Northwestern University. During his presentation, Varga shared his philosophy that mentorship should be personalized to each mentee, similar to precision medicine. Varga also emphasized the importance of paying it forward in science and medicine.